For some reason, even after I announced the questionable purchase of my eighth dysfunctional vehicle—a 1979 Jeep Cherokee Golden Eagle—readers continue sending me Craigslist links to total shitboxes, which I definitely shouldn’t buy... Right? I’ve been told repeatedly by my doctor, shrink, accountant and mother that I should probably stop buying less-than-running cars if I want to live anything close to a healthy life. But sometimes there’s just a deal that I can’t pass up. That 1979 Jeep Cherokee Golden Eagle, for example; what kind of arrogant prick would I have to be to decline a vehicle that majestic and that cheap? Exactly. But there will always be good deals out there, so my strategy to avoid accumulating more iron on my front lawn is now rather simple: stop looking at Craigslist. If I don’t know about a dirt-cheap, only-marginally-rusty FB Mazda RX-7, then my wallet, yard space and sanity are safe. But alas, Jalopnik readers have ruined that plan, sending me Craigslist links containing machines like this 1973 GMC rat rod, which is simultaneously horrible and amazing. Sent to me by a Jalopnophile named Adam, this abomination is a GMC cab with some Jeep CJ fenders grafted on, a widened Jeep grille up front and a custom, rusty bumper that’s so far ahead of the front wheels. It’s hilariously awkward—you can forget about the approach angle. More importantly, the hood doesn’t even exist! There’s just some sort of metal grating on the sides, with wooden boards around the periphery and a gaping hole in the center, where eight “stacks” shoot straight up from the engine. Seriously, what is going on, here? Is that just a box that bolts to the top of the carb, and houses an air cleaner? Clearly, the owner (or the company that outfitted it) built this beast for function. Described as a “custom sleeper & canopy,” it looks like a truck turned into an apartment building. There’s a giant window on one side of the cubic center section (the sleeper), and a door on the other, with skylights above. I love how much wider and taller that sleeper is than the truck cab and bed—it looks totally out of place, as if it fell out of the sky and squished itself between the two. Pickups with sleepers aren’t exactly rare, but I’ve got to say, this red, green and white monster is lovely. Is it $2,900 lovely considering the 6.5-liter diesel needs to be rebuilt? That’s between you and your truck god, but if I were like many other millennials who seem keen to live out of their cars instead of getting real jobs and finding actual homes, I’d definitely check it out. 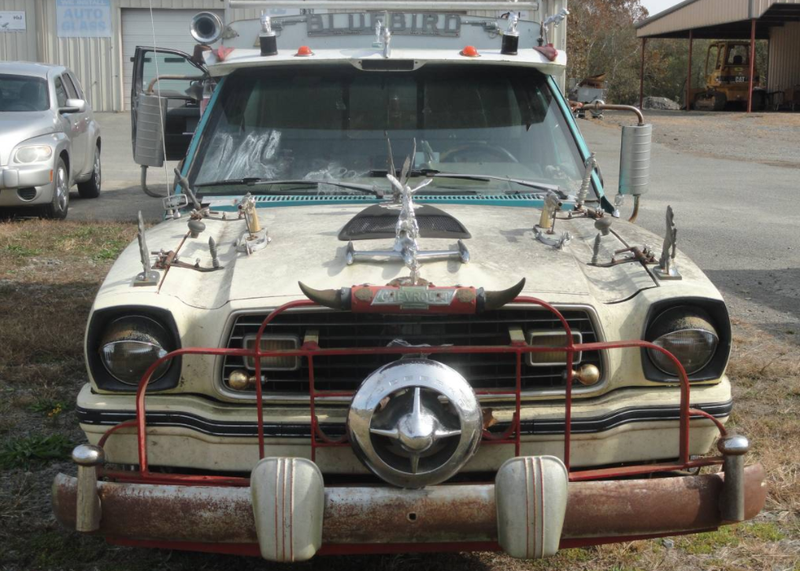 I also dig this weird art car that reader Graison sent me. Yes, like the rat rod shown before, this one tries a bit too hard to be funny—and again, I prefer vehicles that have earned their character through use and age—but it’s a damn Chevy S10 with a Mustang 2 front end! The sheer randomness of that combination is just so charming, I don’t have the heart to criticize it. The rear fenders come off a 1951 Plymouth, which is also odd enough to make me think the intrepid builders probably just walked into a scrapyard and chose willy-nilly whatever car parts they had lying around. Apparently the pony truck runs and drives, though the owner says it’s “a little tricky to shift.” I won’t even give my opinion on whether the $1,900 asking price is fair, because whoever buys this truck is going to have to be one special person, and only they know in their heart what this truck is worth. The next shitbox comes from Richard, who’s an expert junker-hunter; I know this, because I’ve missed many important emails thanks to my inbox being cluttered by his crap-can links. It’s gorgeous, small, rear-wheel drive and manual—perfection, in many eyes. Yeah, it only has a little 1.9-liter four-pot under the hood, and—from what I’ve read—it’s slow as all hell. Plus, this one doesn’t have a title and hasn’t started in four years thanks to what the previous owner alleges was a bad starter. But is that really so bad for $1,000? The answer is: yes. That is so bad. Add the fact that the interior is filled with a bunch of random car parts, and this thing looks like the ultimate money pit. Speaking of money pits, if you’re really low on funds, forget everything I’ve shown so far, and head to Grand Rapids, Michigan, where—as reader Larry showed me—you can buy this Jaguar XJS for the low, low price of...a horse. Now, that’s pretty vague, because how can anyone possibly judge how “good” a horse is when horses don’t even talk? Perhaps there are ways to judge a horse’s character that I don’t know about, but if it were me, I’d buy a cheap, old, dying horse with a good heart, ride it onto a flatbed (that’s how you transport horses, right? ), tow it to the seller’s house, and exchange it for a lovely jag. Then I’d find an engine and trans at a junkyard, and—depending on how much a kind, maybe three-legged, dying horse costs—I could probably wind up with a V12 British coupe for only a few hundred bucks. Yup, that’s totally the logical move, here. No doubt. If you’ve got three grand sitting around, and don’t mind replacing some hideous LED headlights that make Acura’s crazy beams look good, there’s a 1985 Subaru GL Brat for sale in Pennsylvania. It’s a manual car from Oregon that apparently has “extremely minimal surface rust in 2 spots.” Sure, it’s got 317,000 miles on it, but come on: a truck with jump seats in the bed, plus t-tops, a stick, four-wheel drive and a spare 1982 EA-81 1.6-liter motor? At $3,000, it seems to me like the deal of the damn century, though I’m sure I’m just blinded by the light. I’d probably give the seller whatever he or she wanted if this were closer to me. Maybe don’t listen to me on this one. That Brat may weaken my body’s logic-glands, but this Cherokee XJ that reader Time sent me does not. It’s a turbocharged 2.5-liter with a manual. And while “turbo” and “manual” might make you foam at the mouth, that 2.5-liter was a garbage motor, and turbocharging it won’t change that. If you want more power, buy a four-liter Jeep. Don’t dare drop $3,500 on a four-banger with 35-inch tires riding on a block leaf-spring lift and stock axles that may or may not have stock gearing. Just, no. Instead, what you should do is spend those $3,500 on this Volkswagen Beetle built on a 1947 Willys CJ-2A frame. The VW Willys looks incredibly well done, with the clean engine bay housing the venerable Go-Devil engine, and the underbody sporting a classic Jeep frame and solid axles. The custom Volkswagen interior also looks really nice, with the Willys transmission and transfer case shift levers fitting beautifully on the floor between and ahead of the front seats. The seller is asking $4,700, which would buy you a pretty nice Willys or a pretty decent Beetle. But if you’re undecided between those two, snagging this one could be the solution to all of your life’s problems. When it comes to Craigslist finds like the ones above, the physician’s recommended best practice is to abide by the mantra: “Buy first, think later.” Trust me, I’ve been living by that rule for a long time, and everything’s been working out great. Yup, no problems at all.